Home Depot isn't just for Boys Baby! I attended a class with our own Jane Pollack of Art Takes A Village, non-profit for bringing art therapy to women. Jane has been haunting Home Depot and Lowes finding fun items for us to create with. We made these wonderful Gratitude Blocks, as she calls them. I like the name but they are blocks of art, memories, whatever your heart desires the application is endless. 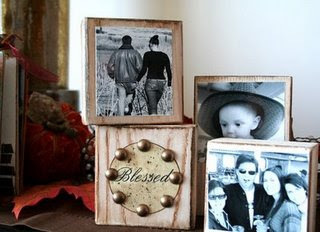 These Gratitude Blocks are made from a loooong piece of 2 x 4's cut at Home Depot into different sizes. The first 2 cuts are free and not that expensive. We don't need a saw for this project :} We then Gesso'd, used oil crayons for definition, collaged, added photos for personalized and hammered lots of fun doo das (ask for those at Home Depot ha ha). 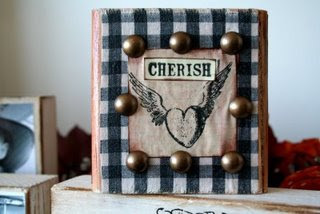 Jane suggested you can stand these blocks on a coffee table, hang on the wall, link together.....the ideas are endless. The class was held at a cute little garden shop, Under the Sun. It was like sitting in a sunny kitchen creating art...what fun. If you get a chance, go by and support Sandra by shopping at her shop. She has some wonderful gifts and unique items for any occasion. My friend, Jane of Art Takes A Village became inspired by some objects she found while shopping and took that inspiration to another level. Aren't these adorable? Want to make one or two? Well, Jane's teaching a class Saturday, October 25th at Under the Sun in South Park. The cost of the class is only $25 and the proceeds go to her non-profit, Art Takes A Village. There phone number is: 619) 281-8481 Address: 2365 30th St.
Art Meetup--We had Fun and Make FABuLOus Bracelets! Elena Etcheverry of Scrapbook Royalty led our class today and we had fun using buttons and beads and ribbons while we crocheted bracelets. My friend had her birthday October 10th and I wanted to make her something for her birthday but I'm still not in the "creative mood" with all the details I need to get into for the remodel but still I believe sometimes a handmade gift says so much more. I was inspired by the doll Sandy of Sandyscreations did and submitted to Somerset. Hers is sooo cute but you can't see it until it hits the magazine. A sweet lady with a martini glass as her body. Luckily it came off without a hitch. I soldered it to the bottle top and did some soldering and adding of jewels at the bottom. I think it turned out pretty good, if I do say so myself. Bonnie said she loved it and hopefully it will fit in somewhere in her home. I hope she will think of a wish from a friend for happiness whenever she glances at it. The chance to have an Art Studio...can't wait! My husband and I are currently living in a two-story home with all the bedrooms upstairs. It is harder and harder for my husband to manage the steps and has taken a spill or two so we decided it's time to move or add-on. Of course, money being tight we'll have to get the remodel done and then work my way into fixing up "the studio" but I have it on my vision board and IT WILL COME TRUE. I will be posting polls from time to time when I think of a question I want your input.......but don't let that stop you from posting any idea.......all are welcome. 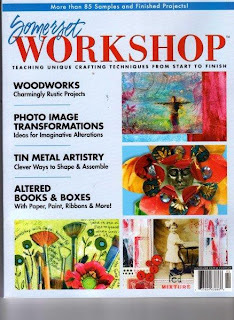 I now have the NEW Somerset Workshop Magazine Autumn 2008 issue for sale. Newstand price is $14.95 plus tax. I am selling my last two for $13.00 each which includes media shipping. I accept PAYPAL or money orders. Email me if you want one. This issue has some great projects. I am in the middle of a home remodel and after that is completed, I will be turning our master bedroom into an art studio for ME. yay!!! So I want INPUT and ideas. Where better to turn than to someone that has created her own special place. Her name is Norma and she lives in Leucadia. I emailed Norma and she graciously told me to stop on by and check out her studio. She also gave me lots of great insight for what a studio should have....lights, and more lights, outlets, storage, etc. So....yesterday Jane and I took a little field trip to Lecaudia to check out her studio. She has built her studio behind her home and there is nothing blocking a beautiful view of the ocean from the doorway. Wow! what a wonderful place to create and what a blessing to have all that space to do your work. Norma has special workshops at her studio by local and worldwide known artists. She has open studio days for those that want to come and work on their art. WHO: Katerine England (www.katherineengland.com) will give a 2-day glass mosaic workshop. Katherine is an accomplished mosaic (and many other media) artist...check out her website! Her extensive experience includes HUGE outdoor installations, public art commissions, and teaching at ArtFest and the Muckenthaler Cultural Center. HOW MUCH: the cost is $160 plus $30 lab fee (that includes everything...glorious colored glass, wood pattern, tools such as nippers and cutters, grout, glue, etc.) She will bring extras of her favorite tools if you want to buy them. WHAT: Katherine will help us create a brightly colored glass mosaic (see attached photos). Each person will choose one of five pattens: cat, skull (it is almost the Day of the Dead), heart, butterfly, or seahorse . You will learn various cutting techniques, about what materials to use where (both for indoor and outside mosaics), and everything you ever want to know about adhesives, surfaces, grouts, colorants, sealants, tools, glasses, tiles. WHY: you will go home with a wonderful finished mosaic plus information sheets to last a life-time. DISCLAIMER: we are not responsible if you rush home and smash your favorite china. OTHER STUFF: feel free to contact Katherine directly with questions. Her e-mail is queenladeeda@yahoo.com. You can bring any special piece that you may want to add to your mosaic. For a broader creative experience send Katherine or me an e-mail asking for her list of interesting mosaic artists that might influence and inspire. Thanks Norma, your Studio is fantastic and no wonder you love showing it off.